Since the cellular technology revolution, a lot of gadgets have evolved. From simple analog phones that can only be used for calls, now we have smart phones that provide mobile entertainment. These smartphones and tablets, with the right programs and applications, can help boost the cognitive development of growing children. However, recent research showed that too much screen time could be detrimental to children’s development. It becomes more dangerous when these little kids are left with the screens without supervision. Leaving little kids with screens as distractions may seem to free up and give the caregiver some time. However, in the long run, kids that are exposed with too much screens may make less and less active which can lead to other health conditions. This is why the American Academy of Pediatrics recommends that toddlers and school-age children have limited access to screens and other forms of electronic entertainment daily. According to them, school-age children should be limited to two hours while toddlers should only spend an hour with electronic devices and screens. Now, what do we do to entertain kids while helping develop their social and cognitive skills? Well, you may want to ask your granddad what sort of activities they did when they were little! Here are some recommended activities for kids that helps in the motor and brain development of growing kids. I know it would take some preparations, but it will surely be fun! Let’s start with the healthy activities that you can prepare for toddlers. We will also look at some play kits that you can prepare for them. You will be surprised that some of the materials you would need can be readily found in your kitchen! For parents and caregivers, these activities may look like simple games. But for your toddlers, these games are not only fun, but it also helps them develop some skills! Try some of these activities and have fun with your toddler. As the name suggests, this activity involves using the senses. A sensory box helps develop tactile skills and improve fine motor development. It’s not hard to prepare, and you can use any object you want and place it inside the sensory box. So, here are the stuff you need to prepare and how it works. a. A shoe box. Make sure it’s clean and dust free. b. A piece of fabric that would cover the entire opening of the box. c. Hot glue would help you fasten the fabric covering the opening of the box. d. Pairs of small toys and other objects. Make sure they are not too small to avoid the risk of choking. You can use dominoes, cubes, golf balls, tomatoes, toy blocks, clothespin, crayons, and the likes. Make sure that there are two of each item. a. Clean the shoebox and wipe the surface with a damp cloth to pick up dust and other potential allergens. You can use other boxes if you like. b. Next, cover the box with a sheet of fabric. c. Cut a three-inch slit on the fabric. That’s just enough to fit your toddle’s hand and fish items inside. d. Take a picture of the items you intend to put inside on a clean background and have it printed. e. Place the toys and other objects you have prepared inside the box. a. Point which item you want your toddler to take out from the box from. b. Have your toddler insert his hands through the slit and locate the object without peeking inside. c. Give your toddler a praise when he successfully locates the item. d. Ask your toddler to fish the other pair inside the box. e. Again, when successful, give your toddler a praise. This game helps your child develop fine motor skills by fishing the objects inside the box. Also, while learning motor skills, your child also learns about shape and size differentiation. With the visual cue from the pictures, your child also learns visual recognition while playing. Critical thinking is also involved in searching the right piece and the other pair of toy. This game may seem simple, but with enough toys and objects, this would translate to hours of fun! This is a simple game that needs guidance and instructions from the parent or the caregiver for it to be more fun. This game intends to improve your child’s gross motor skill while having fun. This game is not recommended for toddlers who just started walking. a. Paper cups or plastic cups. Plastic pylons would be nice, but cups would do fine. b. A ball that’s just the right size for your toddler. a. You can color the cups or number the cups to help guide your toddler while playing. a. Arrange the cups in a semi-circle with the numbers facing your child. b. Have your child positioned about three feet in front of the cups. c. Ask your child to kick the ball towards the cup. d. To make things more fun, call the number or color of cups you want them to hit. The gross motor skills are highly improved by this simple game. Make sure that you encourage your child while playing as they might stumble on the first few kicks. Move the target closer if your child can’t hit the cups. Playing ball kicks will strengthen the legs and improve your child’s balance. Coloring books are classic activity kits that would keep your children entertained and your walls clean (if you know what I mean!). This game is a lot of fun and helps children learn colors. While learning the colors, this activity also helps develop fine motor skills on the hands and improve concentration. It’s best to provide a pattern to help the child recognize which colors to use. a. Coloring book. If you have a printer at home, you can find templates online and have them printed. a. Set-up your kid’s activity table. b. Place the coloring book on the table and provide the crayons. a. If your toddler hasn’t learned the colors yet, this is the perfect time to teach them about it. b. Guide your toddler and point out which colors to use. c. Have your child repeat what you say to reinforce learning. d. Give praises as your child learns colors. The coloring book is a simple activity that improves your child’s fine motor skill. This also improves hand and eye coordination and helps your child learn colors. As your child learns about the colors, let them do the activity without a pattern. Puzzles are another classic kit that kids can enjoy. Starting at 18 months, you can introduce your toddler with puzzles. You may start with 4 pieces of puzzle initially and evaluate how well your kid is doing. At age 2, children can accomplish up to twelve pieces of the puzzle. At age 3, you can give your child up to 50piece of puzzle. Puzzles are great toys that help develop hand-eye coordination and critical thinking. With your assistance, building puzzles are fun! a. Set-up your child’s activity table. b. Lay down the piece of puzzle in random. a. When first introducing your toddler to puzzles, make sure that you guide them step by step to avoid frustration. b. Only give them the recommended number of pieces that can be easily managed according to age. c. Encourage your child while playing and don’t forget to give praises. Take note the number of puzzle pieces you give your child. Too many puzzle pieces can be overwhelming and intimidating. Make sure that you guide your child while doing puzzles and don’t forget to gradually increase the difficulty. In addition to these activities, you also need to find ways on how to encourage your child to eat healthy! There are a variety of activities that can be done on screens. Even the conventional games have versions for your tablet and smartphones! But do take note that there are games and activities that are best done in the conventional way. Activities with your kid promote fine and gross motor development as well as increase the bond between the kid and the caregiver. It may be convenient to leave children in front of screens, but, it may not be the best method of learning skills. Often, gross and fine motor skills are neglected since physical movements are very limited in front of a screen. I know sometimes we get too busy. But The games listed above won’t take much preparation time and would improve your bond with your kid. Now, don’t hesitate to try them! I’m sure you, too, will have a lot of fun preparing and playing with your toddler! Asian pears fall under the pear family, but people often mistake it as part of the apple family simply because they resemble an apple’s appearance—round and plump. But of course, its shade is lighter than the red hue of an apple but a bit darker than the orange tone of pears. Most people refer to the condition of the skin as “russeted” which means that the skin of the fruit has a slightly rough texture similar to that of cork or a net. The rough spots feature a brownish shade which covers only a small region or the entire surface of the fruit. However, its taste is a lot different than that of an apple. It is equally as crisp and juicy but it has a sweet, melon-like flavor that many kids will surely love so it is a great fruit to incorporate in your kid’s diet. If you love pears, then you might be curious as to what type of nutrition you may get from this fruit. Well, you do not have to look for it any longer since we have all the information you need in this article! Dietary fiber is beneficial for intestinal health and can help promote good bowel movement but more than that, it can maintain healthy blood cholesterol and pressure levels. Read more: The Amount of Calories in Cherries Finally Revealed! Recommended daily fiber consumption may vary depending on the body size, gender, and age of the person but it may range from 25 to 38 grams. According to Healthy Eating, a large-sized Asian Pear can provide you with around 26.1 to 39.6% of this recommendation. These nutrients would be the utmost concern of most people, especially those who are on a diet. A large-sized Asian Pear contains 116 calories, 0.6 grams of fat, and 29.3 grams of total carbohydrates. The body will only function properly if it has a healthy balance of electrolytes. The two most essential electrolytes in the body are sodium and potassium. You will be happy to know that Asian pear contains potassium. In fact, studies have shown that it can provide you with around 7.1% of your daily potassium requirement. This is the most potent antioxidant of all, and it can help boost your immune system, facilitate faster wound healing, and repairing and maintaining teeth and bones. Studies concluded that Apple Pear contains 11.6 % of the recommended vitamin C intake for a man and 13.9% for a woman. This is an important vitamin in blood clotting mechanisms in the body. It is discovered that Asian Pears contain around 5.49 micrograms of vitamin K.
This is a micronutrient which is responsible for maintaining blood and bone health. It is also essential to the maintenance of red blood cells, energy, and collagen. As per studies, Asian Pear can provide you with 15.3% of your daily copper requirement. Based on these Asian Pear Nutrition facts, there is no doubt that Asian Pears are some of the most nutritious fruits in the market. That is why it is highly recommended that you incorporate more of these fruits in your diet. Lucky for you, there are plenty of ways on how to prepare it so you would not have any problem with it! Similar with peaches, nectarines are popular summer fruits because of their light and refreshing taste. Let us also not forget about the fact that their juiciness can help quench your thirst and hunger during the warmer days. But how many calories in nectarine? Should you take a chance in eating this fruit even if you are on a diet? We will learn more about this information in this short article. People who are on a diet tend to tread lightly when it comes to consuming fruits as these tend to contain lots of calories. But according to many people, nectarines are low in both fats and calories and rich in essential nutrients that the body needs. Well, this is not a hearsay. In fact, Livestrong states that the calorie content of nectarines ranges from 50 (small), to 62 (medium) to 80 (large). Because of its low-calorie content, many people consider this fruit to be an excellent dessert option during the summer season. But of course, despite its low-calorie content, nectarines have around 14.89 grams of carbohydrates, 6.92 g of which is in the form of sucrose, 2.23 g in the form of glucose and 1.95 g is in the form of fructose. In addition to this, nectarines also contain high amounts of fiber which is why a lot of people find this to be a filling food item. According to Healthy Eating, a small nectarine contains 2.2 grams of fiber, a medium one has 2.4 grams of fiber and lastly, and a large-sized nectarine will provide you with 2.7 grams of fiber. Of course, this is also protein-rich food. Studies have shown that an average-sized nectarine contains 1.51 grams of protein. Since most fruits do not usually contain a high amount of proteins, this protein content is already considered to be quite significant. And wait, there’s more! Nectarines are also regarded as nutrient-rich foods. For one, it has a significant amount of vitamin E. A small nectarine contains 0.99 mg which is 7% of daily recommended intake while a medium nectarine has 1.09 mg of vitamin E and a large one has 1.2 mg of this vitamin. This vitamin is a powerful antioxidant that protects the skin and protects it from signs of aging. Secondly, different sizes of this fruit contain vitamin A at a range of 22 to 27 micrograms. This vitamin is essential to eye and blood cell maintenance. Lastly, it is also a vitamin C-rich fruit as a serving of this fruit can provide the body with 7.7 mg of vitamin C. This antioxidant can boost the immune system and protect you from possible diseases. You don’t have to ask too many questions any longer. The answer here is plain and simple. Nectarines are low-calorie fruits that can quench your thirst and satisfy your sweet cravings in the healthiest way possible! The Amount of Calories in Cherries Finally Revealed! Calories—these are the death of us, especially those people who are trying to lose weight. If you are one of these people, you might be counting the calories of every food you eat and shy away from anything that is sweet, salty or oily as they tend to contain the most number of calories. Due to its sweet taste, cherries are often thought of as high-calorie food items. But how many calories in cherries? Let us figure that out in this article! Well, we will tackle this topic head-on. Let us begin by answering the most critical question of all— how many calories in cherries? As per Very Well Fit’s statement, one cup of cherries contain less than 90 calories. That is already considered to be low considering that a cup of cherries can already fill you up. Moreover, cherries are an excellent source of vitamin C. In fact, a cup can provide you with %16 of the recommended daily vitamin C intake. In addition to calories, cherries are also rich in other nutrients that are essential to maintaining healthy bodily functions. The same amount of cherries also contains 3 grams of fiber, a substance that facilitates proper digestion, maintains cholesterol level, and promotes weight loss. As part of the berry family, cherries also contain high amounts of antioxidants. One, in particular, is anthocyanin (the reason why the fruit has its red color) that fight off free radicals and prevent the onset of heart and other age-related diseases. Other nutrients that you can find in cherries are potassium (260 mg), vitamin A, protein (1.4 g), iron and boron. As if cherries are not wonderful enough, you will be happy to know that cherries are also free of fats, cholesterol, and sodium. Read more: How Many Calories in Nectarine? Discover the Answer Here! Aside from the nutrients mentioned, cherries also contain melatonin, a hormone that lowers the temperature of the body, making you feel sleepier. Since cherries contain a good amount of potassium, a micronutrient that is effective in reducing blood pressure. This micronutrient acts by balancing the fluids in the body, offsetting the amount of sodium which is the primary cause of hypertension. Cherries also have high amounts of vitamin C, beta-carotene, quercetin, and anthocyanin. All of these nutrients work together to prevent cancer-causing genetic mutations. Like peaches, cherries are sweet and tasty. Since many people think that low-calorie items should be bland and boring, they often shy away from eating cherries when they are on a diet. But based on the facts that we have provided to you, you can now celebrate the fact that you are free to enjoy the sweetness of cherries without the guilt! Gala apple has become increasingly popular for the past few years. Initially, it is cultured in New Zealand, but these days, it is already grown extensively in the United States. In fact, the industry claims that the Gala Apple has replaced the Red Delicious Apple as America’s favorite. If you want to know the reasons why, you should take a look at this article! The Gala apple is taller than it is wide and has a lighter red exterior and yellowish interiors. The flesh of Gala apples is firm and crisp. Recommended for kids, this apple has thinner skin and easier to bite. It also has a sweet vanilla-like flavor that many people love. On the other hand, Red Delicious is a type of apple that heavier at the bottom and features a dark red exterior and creamy white interior. It is considered to be a juicy yet soft apple, so it does not cook well. With regards to taste, it is a bit bland. Gala Apple Nutrition Facts: What is The Nutritional Content of Gala Apples? Based on a 2000-calorie daily diet, studies have shown that a medium-sized Gala apple can give you 2% of daily vitamin A and iron requirement. It can also deliver 8% of your dietary vitamin C requirement. One mineral that is abundant in a Gala apple is potassium. In fact, it can provide you with 5% of the amount your body needs to stay healthy. Just like all the other apples, Gala apples are also rich in fiber. The fiber found in apples is called pectin. A medium-sized Gala Apple can provide you between 5 to 22 grams. You will be surprised to know this, but apples also contain both complex and simple carbohydrates. In fact, one medium-sized Gala apple contains around 22 grams of carbs. Antioxidants are substances that can fight off free radicals. These are the substances that promote different signs of body aging. Because of this, antioxidants offer plenty of benefits to the body. The good news is, Gala apples contain high amounts of antioxidants. In addition to antioxidants, gala apples are also rich in flavonoids and phytochemicals. These substances can assist in protecting the body from cardiovascular problems. When it comes to calories, this fruit can provide you around 80 calories. Please take note that these values are based on a Gala apple weighing 140 grams. It looks like Gala Apple nutrition makes this fruit worthy to be included in our daily diet. Thanks to its sweet taste, it is also one of the best options to give to your children and encourage their eating habit. If you want to maximize the full nutritional value of this fruit, it is best that you ensure their freshness. You can also eat this fruit raw or cooked (pies, sauces, chips, and the likes!). What do you know? Peaches don’t originally come from cans! Kidding aside, peach is a tasty fruit that is popularly preserved. It is a widely processed fruit that is globally available today. Peach is a native fruit-bearing tree in China and has a significant meaning for the Chinese. According to Chinese mythology, peach is the divine fruit of the gods. It is believed, in China, that consuming peaches can perpetually make people young! Talk about immortality, right? China is the largest producer of peaches in the world. In fact, in 2016, almost 58% of the world’s production of peaches comes from China! But you don’t have to go to China to get some peaches. You can find a lot of different varieties at the grocery store. If you want some rare types of peaches, the farmer’s market may offer you a different variety. Now, let’s talk about those different types of peaches. Basically, there are two main types of peaches, according to the pit; clingstone and freestone. Recently, there is a third category that entered the classification; semi-freestone. As the name suggests, this type of peach has a pit that does not stick to the flesh. Because the flesh does not stick to the pit, this type of peach is easier to prepare. You can easily make wedges out of it! You can even eat it as it is. Freestone peaches are the most common peaches that you can find in the grocery. They are a bit larger than most peaches and a little less juicy than clingstone peaches. Freestone peaches are favored because they are a lot easier to prepare. Commercially preserved and canned peaches are made from clingstone peaches. Clingstone peaches are known for their sweetness and juicy flesh. Clingstones are one of the best varieties famously used in the kitchen. It releases amazing flavors when cooked that’s why it’s one of the best types of peaches you can use for baking and making preserves. Because they are commercially used for canning, you won’t commonly find them at groceries. You have a better shot of finding clingstone peaches at the farmers market. Wouldn’t you want to have sweet and juicy peaches that don’t stick to the pit? Well, you are not the only one who thought about that. Agriculturist has found a way to fuse the characteristics of freestone and clingstone peaches. Semi-freestone peaches are sweet, juicy, and has a pit that does not cling to the pit when picked at the optimal level of ripeness. Semi-freestone peaches are great for fresh consumption and would make great baked goodies too! Peaches are everywhere, and China won’t be lowering down its production anytime soon. So, don’t be afraid that you may shorten the supply if you eat too much! Go ahead and knock yourself out. If you truly love peach and you can’t get enough of it, why not try peach picking sometime? Have a friend come with you! It would be a lot of fun! What Does Sleeping on the Floor Do To Your Spine? As human beings, we roughly spend a third of our lives sleeping. That means that for around 8 hours a day, we lie on comfortably on our soft bed. But sometimes, no matter how soft are beds are, we wake up with some discomfort on our backs? Now, why is it that we get that soreness even when we have the softest and most comfortable bed there is? Well, it has something to do with the human anatomy, and many experts have been campaigning and advocating sleeping on the floor! Yep, you heard me right! Sleeping on the floor, according to experts, is better than sleeping in a mattress. Why? Let’s find out! We know about the proper posture, right? Yes, we know how important posture is when we are standing upright. We know that proper alignment of the spine is maintained with proper posture. This decreases the likelihood of getting your back sore. However, when sleeping, we fail to notice our crooked posture! When we lie down on our beds, we often forget about our posture and assume whatever comfortable position we wish. The problem here is that, if we sleep roughly 8 hours daily, that translates to 8 hours of misaligned spine! Studies show that the best sleeping position is lying on our backs. This keeps the spine in a neutral position. Soft mattresses do not permit us to sleep straight on our backs. When lying on soft beds, the natural tendency for our body is to sink on the plush bed. The bed hugs us back and does not offer any resistance. This may feel comfortable at first, but, it would not allow your spine to stretch in its neutral position. Soft beds would hug the curves of our backs and would put stress on the opposite curve of the joints. This can lead to disc inflammation, muscle soreness, nerve inflammation, spasm, cramping, stiff neck, back pain, and other discomforts that may extend to some other parts of the lower limbs. Beds are globally available and globally used for sleeping. Every night, especially when you had a long day, and you are tired, you look forward to lying on your bed. It would seem like an insane idea to give up the bed and sleep on the floor instead. It sounds counterintuitive to sleep on the floor when a bed is available! 1. Get rid of back pain. You may not notice back pain until there’s too much of it. We are so accustomed of sleeping on soft mattresses that we fail to recognize, even ignore the back pain. What do we do about that back pain? Well, we get expensive therapies and medications to get rid of it. For a while, the therapy and medication work. But later, the pain goes back. Sleeping on the floor helps you get rid of that back pain. When you finally make the switch, your spine returns to the neutral position and relieves the pressure from the joints. Can you imagine breaking free from back pain? 2. Get rid of the stiff neck. Because our bodies sink while sleeping on a mattress, our head is prone to be in an awkward position. Well, the crucial part that connects the head to the body, the neck, may become sore. Sleeping on the floor aligns the cervical spine and helps eliminate stiff neck. When sleeping on the floor, the entire span of the spine falls on the neutral position. Not only does this neutral position eliminate pain, but it also improves your standing and sitting posture. As your spine returns to its natural curvature, your standing and sitting posture improve as well. Lying on the floor encourages peaceful and more restful sleep. The muscles are more relaxed while lying down. With a more restful sleep, you will be waking up with more energy. When you get to have that peaceful rest, definitely, you could start your day easy! With better sleep comes better mood when you wake up. Getting rid of the bed means that you would free space inside your bedroom. Sleeping directly on the floor, as cavemen did, may result in some other form of back pain. If you sleep directly on the floor without any form of a cushion, your shoulder blades and your hips will hurt badly in the morning! A towel, yoga mat, or carpet would do great in protecting your back from this kind of pain. Sleeping on the floor may sound a little intimidating, and the first thought you may come up with is more back pain instead of relieving it. When the spine gets properly aligned, back pain starts to go away. To counter pain that may arise from the bony prominence on the back, an egg crate mattress can be of great help. An egg crate mattress topper is not thick enough for the body to sink. It gives your back enough cushion to comfortably sleep. The mattress stays firm while it’s on the floor giving you enough cushion without sinking. Now all you need to do is figure out how to increase your melatonin levels and you can enjoy good night’s sleep! Giving up your bed may sound like a drastic move. Although sleeping on the floor is backed by research and anatomical evidence, it may not be for everyone. So, before you ditch your bed, you may want to try it out first! To facilitate your switch from bed to the floor, you may want to use a cervical pillow instead of your conventional pillow. This will help you align your back and your head to avoid getting a stiff neck. A rolled towel will pass as a cervical pillow if you don’t have one at home. Putting a pillow under your knees would further help align your lower back and relieve pressure on the thoracic region. You don’t have to put up with the back pain and stiff neck. You can try sleeping on the floor and see how much it reduces the pain and improves the quality of your sleep! The back is the most highly recommended sleeping position by scientists. It affords the best cervical spine support and the least pain. But if you suffer from back pain, then sleeping in any position can be horrendous. When you suffer from back pain, the back position is recommended to help relieve pain. This is not always achievable unless you have a good mattress. If you can’t afford to just spring for a new mattress, then a mattress topper that fits right you’re your mattress can be your saving grace. Here I compiled some of the best mattress toppers that helped me after my car accident left me with terrible back pain. My hope is to help you find one that really helps you! 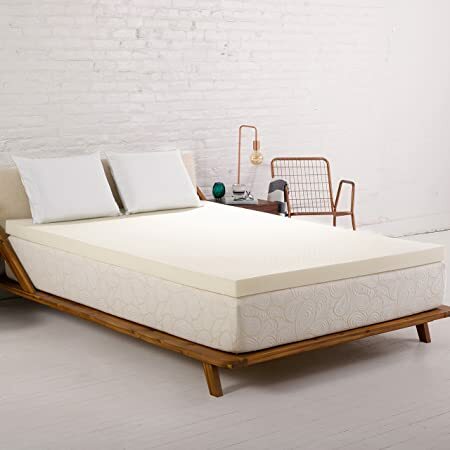 Overview: This mattress topper offers the comfort of memory foam, the cooling capabilities of gel, and open cell technology to prevent full body impressions. It is comfortably thick at 2 inches and not too heavy. Review: My back adored this mattress topper. 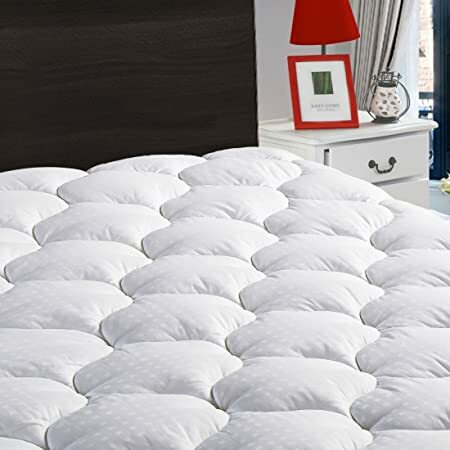 It transformed my mattress into a wonderful cloud of springy firmness. I did not get hot or sweat and my allergies were not triggered. I had to let it outgas and it emitted a foul odor. It lasted nearly two weeks. But once it dissipated, I thoroughly enjoyed the back support I got from this topper. 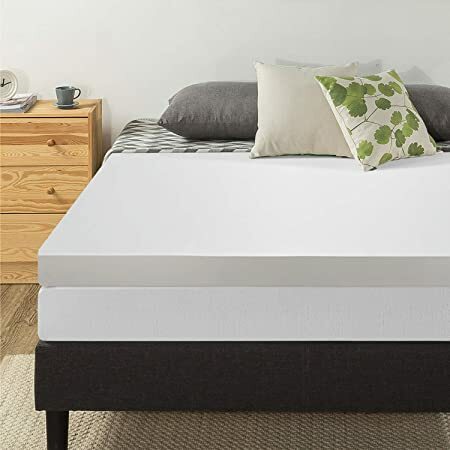 Overview: Made with high quality ViscoElastic memory foam, this topper will add lots of spring support for your back to your bed. This doesn’t smell and has cooling technology for a more restful slumber. It is Certipur-certified to guarantee environmental safety. Review: I felt that this topper was a mattress of its own. It offered superior memory foam support that kept my spine straight. However, it did not develop an imprint, staying true to its promise of retaining shape. It lasted for nearly a year before starting to lose comfort. I found it incredibly hard to maneuver out of the box, but I enjoyed that there was no weird odor. 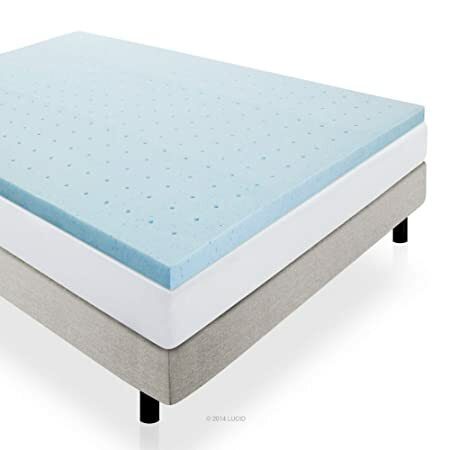 Overview: Boasting 2.5” of high density foam and 1.5” of memory foam, this topper has a zipper mesh cover and body isolation so your movements don’t disturb your partner. At four inches, this topper weighs nearly 25 pounds, but it a dream to sleep on. It lacks cooling technology and must be spot cleaned and air dried. The top layer is infused with green tea. Review: At first I loved this topper, and I still do in some ways. Laying in it felt like my body was being held by the body-conforming memory foam. I think the green tea infusion works because I slept like a baby, with no back pain in the morning. However, as summer rolled around, I began to wake up with my back sticky and sweaty. This did not make for great sleep. I recommend it if you are not in a hot climate. 4. Leisure Town Cooling Mattress Topper Editor’s Choice! 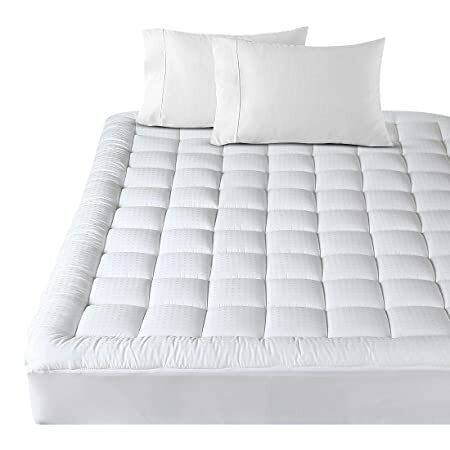 Overview: This topper boasts 42 oz of hypoallergenic fill and a tufted quilt design to give you your best night’s sleep. It is hypoallergenic and antimicrobial. It is designed to avoid slipping and sliding. The cotton surface is designed to feel good against bare skin. Comes with deep pockets to fit onto your mattress without slipping, sliding, and bunching under your back to ruin your sleep. Review: This topper arrived in a vacuum box and smelled a lot like memory foam. I was surprised to realize it was purely cotton. However, the cotton material was a blessing because it did not trap heat and it felt “natural” on my skin. I found it to be light and easy to wash. These were all pluses that made me fall in love with this topper, but the crowning moment was when I woke up with no back pain. This topper arrived some firmness but also softness. The result was wonderful for me and for those who like softer toppers. Overview: A supportive white alternative goose down and cotton topper, this Balichun topper has deep pockets to keep it in place. The box stitch design helps add to comfort. The fill is held in place. The elasticized edge helps hold it in place as well. It is fully washable. The cotton top and fill are hypoallergenic but those with goose down allergies should watch out. Review: I was skeptical about using goose down, but my stance changed when I actually tried this mattress topper. After dealing with years of back pain, I was nervous that this one would shift or otherwise be uncomfortable. The first night was great. There was no odor but it did need to outgas in the sun because it was vacuum packed. Then I slept on it and woke up pain-free. It was like sleeping on a comfortable cloud, with no heat or bunching issues. After washing it, I was scared it would be ruined, but it retained its shape for nearly a year. This handy guide helps you determine what to look for in a mattress topper. A thick mattress topper is not always necessary. They are usually very thin, but their added features makes them comfortable without any extra thickness. This bodes well for fitting your old sheets on your bed still. As a back sleeper, you need a firm mattress topper to lend support to your spine. Something too soft will worsen your pain. You have various materials to select from: memory foam, shredded memory foam, gel- or water-filled, microbead, and fiber padding. Memory foam or shredded memory foam is great because it helps conform to your body, but they are warm and trap heat. Gel pillows are often cooling, which can bring about comfort particularly in sweltering climates. Gel memory foam is the best of both worlds: cool and comfy! Don’t consider down toppers because they contain allergens and fall flat within a year. Cotton can also do this unless it is comprised of a special technology. Cooling technology. This technology keeps trapped heat from building up and bugging you as your sleep. Hypoallergenic. These toppers repel dust mites, which cause allergies. They may also have flame retardants. Washability. Some materials cannot be washed easily and must be spot cleaned. Determine how much you are willing to wash and if you are OK with spot cleaning. Double check the material to avoid ruining your topper. Waterproof. This is useful for a lot of reasons. You don’t want a wet bed! Comfort. Don’t go for toppers that are too hard, too soft, scratchy, or stiff. Always keep how much you are willing to spend in mind. Amazon makes it easy to compare prices, warranties, and guarantees to find what will give you the most bang for your buck. You will likely find something within your budget that meets your needs on the marketplace. To heal your back and gain quality sleep, a quality topper is essential, so consider it an important fixture in your budget. If you suffer back pain, you know how hard it is to get quality sleep. A mattress topper can fix that if you can’t afford a special new mattress. You can browse Amazon to find your ideal mattress topper for back pain!